... Bet your bottom dollar that tomorrow, There'll be fun. 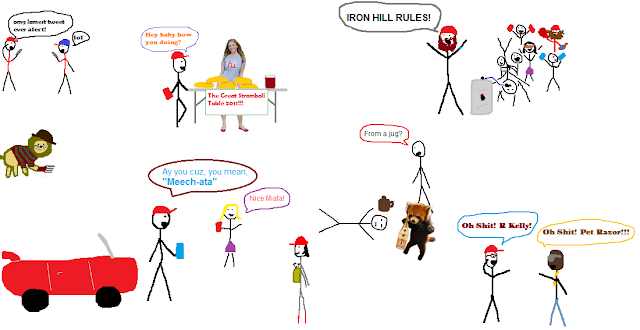 Hey kids, as you likely know by now (but yo if you're seriously just finding out right now your Friday just got way funner), the Fightins Tailgate 2 "Tailgate Harder", Featuring #ZWRBEER (sponsored by Iron Hill North Wales) is tomorrow. Yup, right after breakfast and before one of you gets arrested. I think the Phillies play, too. Because I'm excited about the whole spectacle, not to mention the brew, I decided to sketch something up. Let's just say it's how I envision this thing going down. * Yes: John Gonzalez of the Inquirer will be there signing autographs and posing for photos. * No: Ukee Washington will not be there. His people confirmed last night. * Maybe: Todd Zolecki is bringing funnel cake. As you read in the link above, Vince the Beer Guy is tapping the So Cuttered Hoppy Wheat keg tonight in North Wales, and generously offering a free taste (before the free tastes tomorrow) to anyone from Donkey Nation that shows up in the appropriate swag. So head on up if you have the evening free, sample the concoction, and show some love to a place that's being very kind to the bolg's readers. Without hyperbolizing, this is basically humanity at its very best. So if I showed up at Iron Hill Brewery in my original Banned in the USA tee I'd get free ZWR beer tonight? Is Wertz coming to the tailgate?!?! I am five #zwrbeers deep... so cuttered right now. Probably shouldn't have driven home from Iron Hill. Awesome! I live about 20 minutes from the North Wales Iron Hill...I'll have to check it out.